Having written about Little Saigon over many years, I was looking at my last post from a year ago and realized I should update the entry. One of my favorite restaurants, Hanoi, closed and in the past year I discovered new restaurants and supermarkets I wanted to recommend. Certain foods cause people to become rhapsodic. 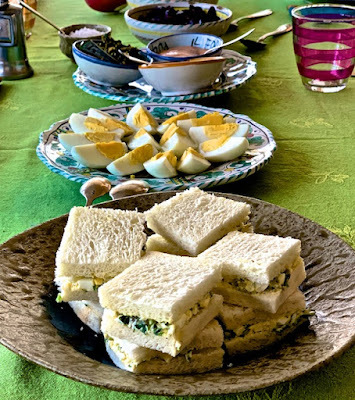 Proust had his madeleines. 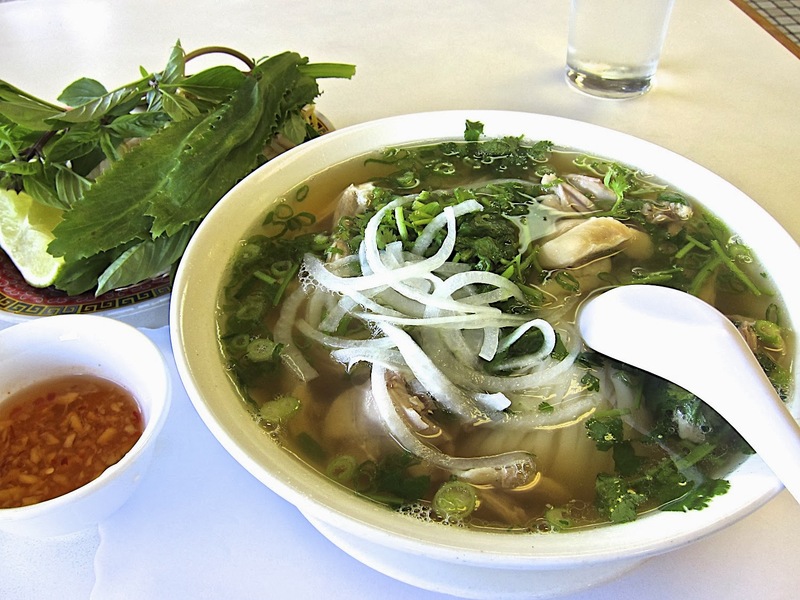 I have pho ga. At Pho Vinh Ky, the large bowl of chicken soup and rice noodles arrives with a plate of fresh herbs and vegetables and a small bowl of dipping sauce. Traditionally, the herbs and vegetables are added to the broth. Rau ram, ngo gai, bean sprouts, mint, Thai basil, purple perilla, a lime wedge and thick slices of serrano peppers add brightness to the flavors. I love the dipping sauce, nuoc cham gung, a mix of lime juice, dried pepper flakes, finely chopped fresh ginger and fish sauce. Everyone has their own way to eat pho. Mine is to eat the noodles first. 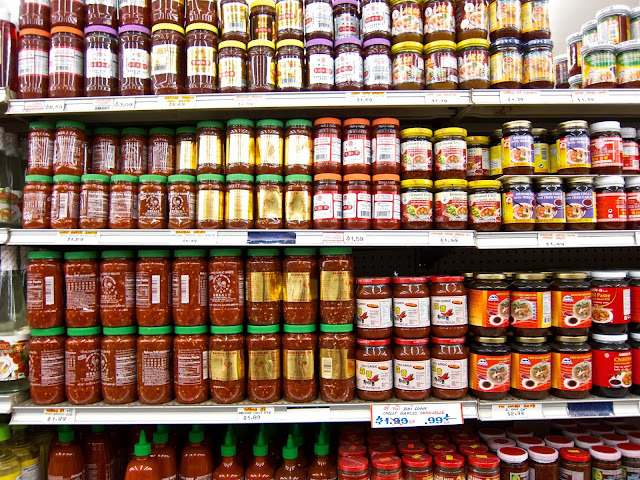 Each spoonful flavored by the pungent, hot, salty dipping sauce. If you haven't eaten Vietnamese food, you have missed out on one of the great Asian cuisines. Known primarily for their noodle soups, plates of barbecued meats piled high on mounds of broken rice or served in a bowl with vermicelli noodles and stir fries spiced with lemon grass, Vietnamese food has spread into the wider culinary community because of the popularity of pho (hot beef and chicken soups with noodles) and banh mi (crusty baguettes with spicy meats and pickled vegetables).With several large Vietnamese communities around the country, we are lucky to live close to Little Saigon in Orange County. My trip to Little Saigon begins at Pho Vinh Ky with a large bowl of pho ga (chicken soup with noodles), only dark meat, and a Vietnamese iced coffee with milk. Arriving early in the morning, the restaurant is cold and mostly empty. The large window faces a small parking lot bordering busy Westminister Boulevard. A dozen Vietnamese men and women are also eating pho. Their heads bent low over the steaming bowls, chop sticks in one hand, a Chinese soup spoon in the other, they eat the more familiar, beef version of pho. Because we live an hour away from Garden Grove and Westminster, the epicenter of Orange County's Vietnamese community, instead of eating several dishes at one restaurant, I'll eat one dish at each of my favorite restaurants, taking home what I don’t finish and moving on to the next one. If you hadn’t guessed, that means I bring freezer packs and a small cooler for take-away because the left overs are delicious for next day-breakfast and lunch. In between meals, I'll hunt out the best bargains at the local supermarkets. 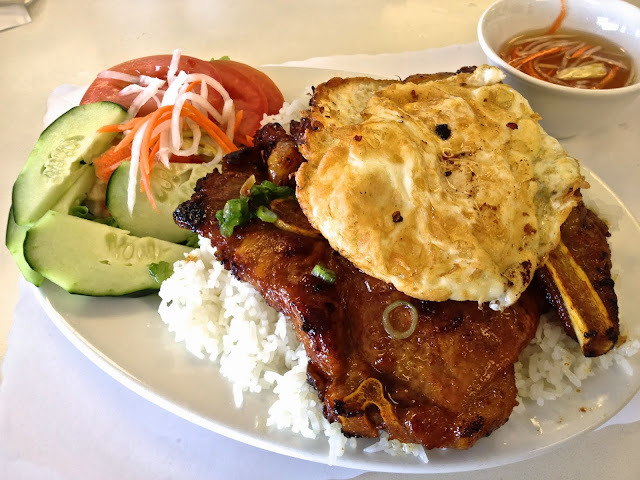 Here is the list of places I love going to in Little Saigon. Hope you have an afternoon to explore the area. A few weeks ago, I brought home two live Dungeness crabs from ABC (see below: a supermarket on Bolsa at Magnolia) for $5.99/lb. The shiitake mushrooms were also a bargain at $4.79/lb. Many of the restaurants only take cash. Most of them open for breakfast and stay open until late (which can mean 7:30am - 11:00pm; but often it means 10am - 10pm). Next to the Stater Brothers’ Market, west of Magnolia, east of Beach (Beach Blvd Exit on the Garden Grove/22 Fwy), Pho Vinh Ky has the best pho ga (chicken noodle soup) in the area. The light broth is clean tasting, the dark meat is sweet and the noodles are chewy. The interior is nondescript. The waitstaff is friendly even if they don't speak English. 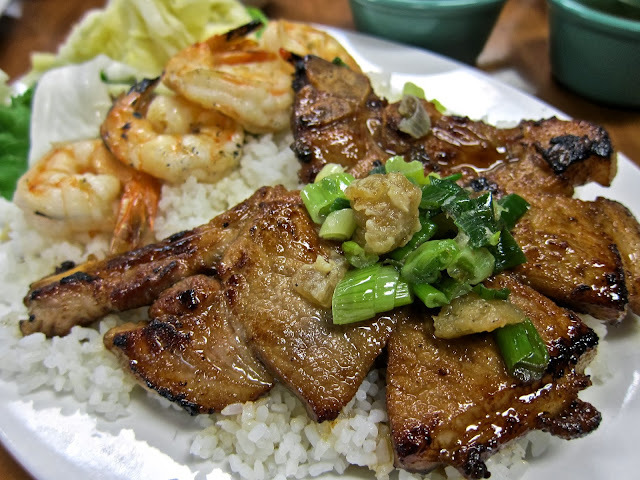 Besides the pho ga, the other dishes I would also recommend the spring rolls with shrimp and pork, crispy rice noodles with vegetables and tofu, BBQ pork with vermicelli, BBQ shrimp with vermicelli, the pork chop with broken rice and the BBQ pork with broken rice, topped with a fried egg. When Hanoi closed, I needed to find a replacement quickly because my wife loved the restaurant's catfish with dill and onions that was served on a sizzling hot plate. Chả Cá Thăng Long is a staple of Vietnamese cuisine. 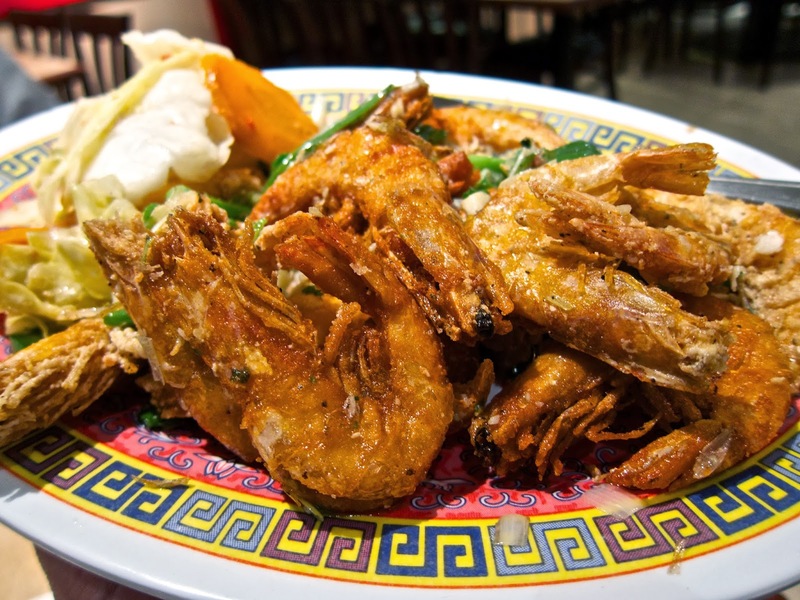 After a good deal of research, I found the dish served at Vien Dong, a large and elegant restaurant on Brookhurst in a neighborhood dominated by car dealerships. Besides the sizzling catfish (#22), the fried spring rolls with pork (#2) is also delicious. Both dishes come with a plate of freshly prepared vermicelli and enormous plates of fresh green leaf lettuce, cilantro and Vietnamese herbs. The combination of savory, crisp, heat, sweet and citrus has to be experienced to be appreciated. Just saying they are delicious isn't enough. In a mini-mall, Grand Chicken Rice Restaurant, serves very good egg noodles with lemon grass chicken, tofu or vegetables. 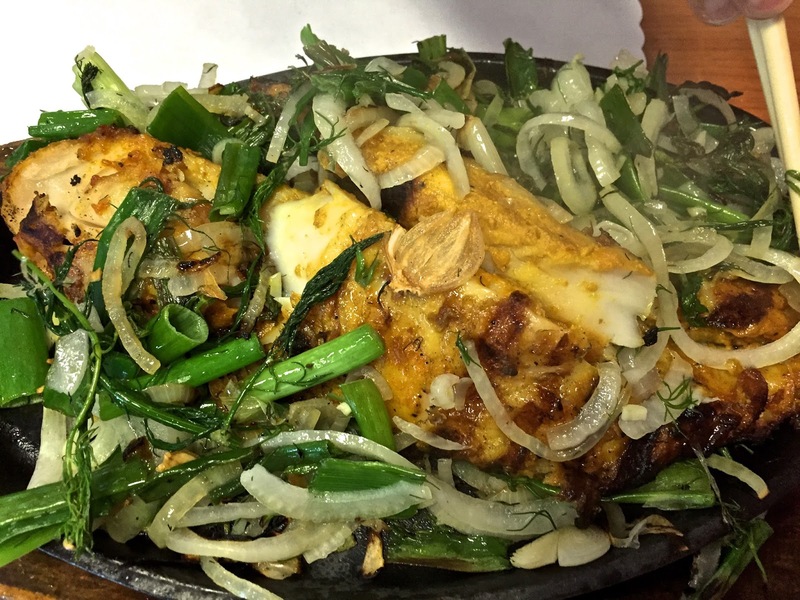 The small portions make the dishes pricey for the area, but the dishes are well-prepared. Dim Sum - Giai Phat Food Co. 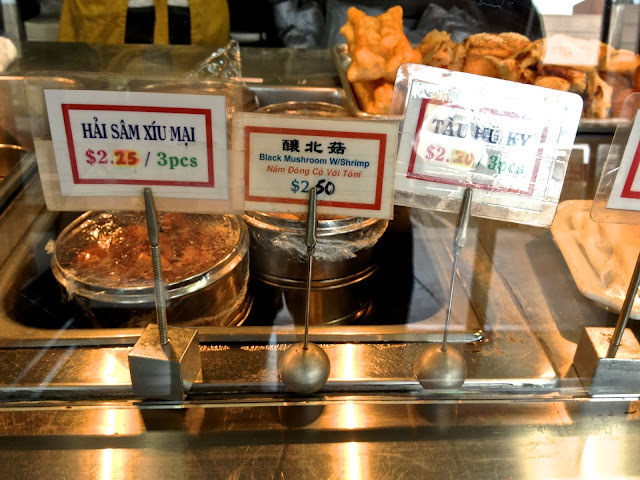 In the outdoor mall next to Grand Chicken Rice Restaurant, there are a dozen other restaurants including a Chinese take out restaurant serving inexpensive, well-made dim sum. The first restaurant in Little Saigon we tried a dozen years ago, Dong Khanh is still a favorite. The restaurant opens early in the morning and continues to serve well past midnight. The menu is quite large so there are many different dishes to try. I always get the lemon grass chicken with broken rice, the fried shrimp (head on, in the shell) with pickled cabbage and carrots, crispy noodles with sautéed vegetables and, when we have a large group and we have the extra money, a salt and pepper whole lobster. Dong Khanh also serves very good iced Vietnamese coffee with milk. 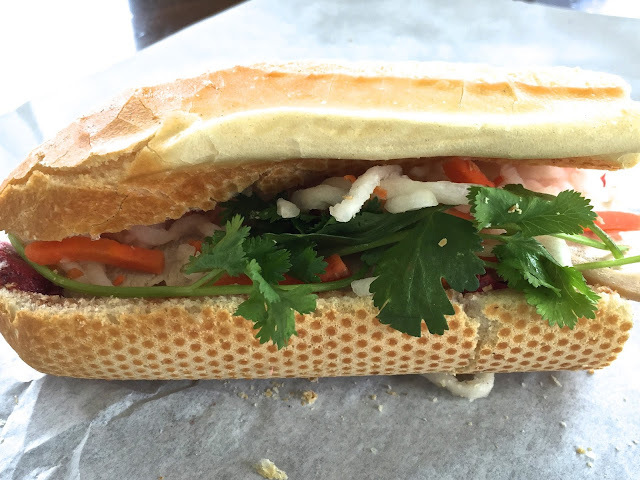 On the eastern end of a mini-mall with half a dozen small restaurants there is a French-Vietnamese bakery/restaurant called Le Croissant Dore that sells good Vietnamese style French pastries. One of the specialties of the kitchen is a bœuf bourguignon that’s spicy with unexpected heat. Served with a freshly baked baguette, customers eat in a small dining room within sight of the bakery counter or outside at half a dozen tables which are usually occupied by circles of men, talking and reading newspapers. The Vietnamese iced coffee with sweetened condensed milk is delicious but very strong. A few doors from My Thuan, an excellent Vietnamese supermarket, Saigon's Bakery sells breads, rolls and Vietnamese pastries, drinks and sweets, which, for most items, when you buy two, the third is free. People stand in line to buy the foot-long banh mi with a dozen different fillings. The baguettes are perfectly crisp on the outside, moist and chewy on the inside. There are a great many supermarkets in Little Saigon as well as Korean Markets in Garden Grove. Each one is different although they carry many of the same products. The prices are also pretty much the same, but there are notable differences between them. A large supermarket with excellent fresh produce, dried noodles and frozen seafood, My Thuan has better prices than most of the nearby markets. My wife loves charred octopus salad with potatoes. My Thuan sells both fresh baby octopus and large frozen octopus. 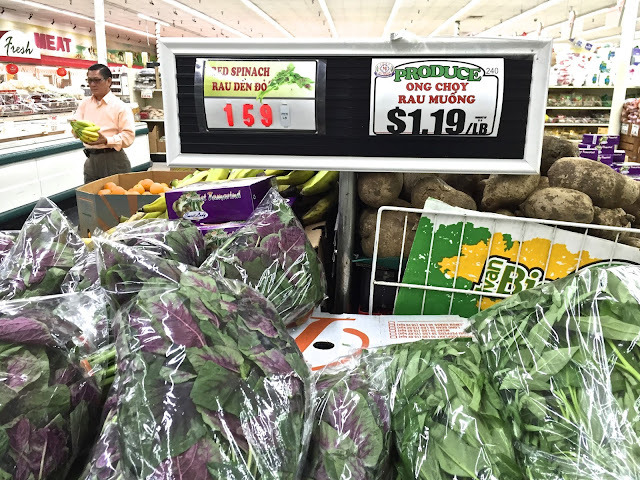 The fresh seafood, poultry and meat counters have all the cuts familiar to anyone who shops in Asian markets. The quality is above average. The prices are very affordable. MOM has a good fish market but while they have live seafood, the prices are better at ABC; they have a fantastic dried and fresh noodle area and great selection of Asian sauces. Great for live lobsters (usually $7.99-$8.99/lb) and Dungeness crab ($5.99-7.99/lb), they have a large selection of fish, some in live tanks, fresh and frozen. The produce section is excellent, with shiitake mushrooms, leafy vegetables, citrus, onions, aromatic herbs and garlic as well as fresh poultry (chicken and duck), beef and pork. Sharing the parking lot with ABC Supermarket are a dozen other businesses, restaurants and bakeries. 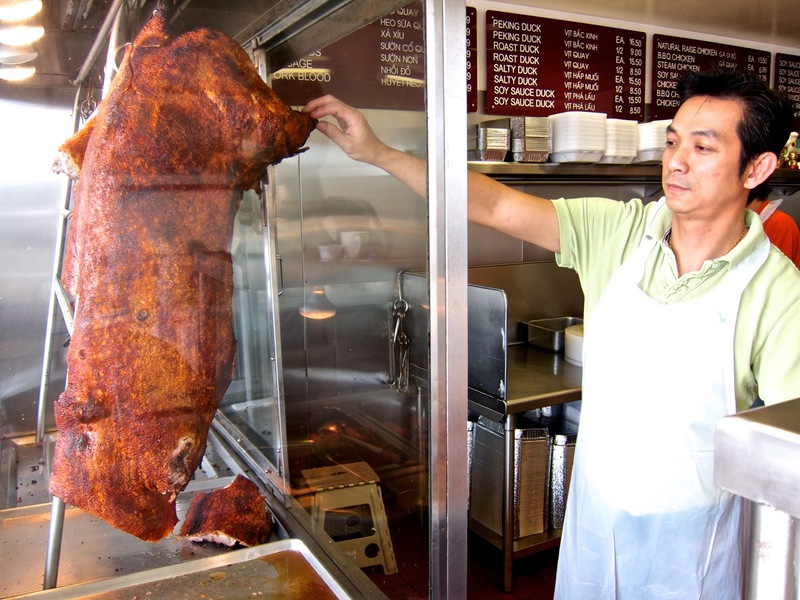 Bolsa BBQ sells freshly prepared whole pig, chickens, ducks and delicious bao with hardboiled egg & pork. The majority of dried noodles sold in Asian markets use lye. One of the few companies to avoid using lye in their noodles is found at Dalat: Twin Rabbit Vegetarian Noodles (Mi Chay Soi Lon) Product of Vietnam - dried wheat noodles: $1.19.